In the midst of the disputable yet exceptionally rousing speech of Senator Manny Pacquiao, before the Oxford Union, netizens rushed to respond with beguilement, pleasure and pride to the nation's WBA welterweight champion. 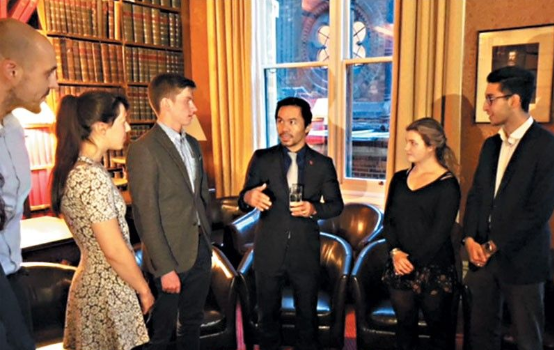 It was reported that Sen. Pacquiao was invited to join the ranks of a few recognized speakers by Oxford Union, where the latter spoke from the heart in a one-on-one interview on stage in front of an audience at a stuffed assembly hall on the school campus late Monday afternoon. With so much pride and honor, our very own Sen. Pacquiao has been said to scored a knockout in his visit to the English university, appearing to be a true and humble individual without any pretenses and with a genuine want to elevate humankind. The said speech made a great deal of Filipinos pleased to Sen. Manny, some even compared him with the nation's Vice President, Leni Robredo. 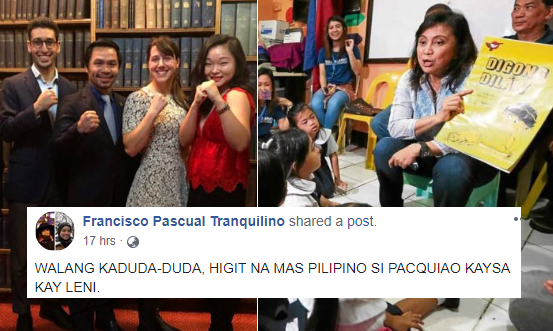 University of the Philippines Professor, and a Doctor, Francisco Pascual Tranquilino, was one of those who showed admiration to the senator, that in a recent Facebook post, he shared parts of Sen. Pacquiao's speech, yet fires a striking counterblow to VP Robredo, and bravely said that it is indeed without a doubt that the senator is more Filipino than the vice president herself. 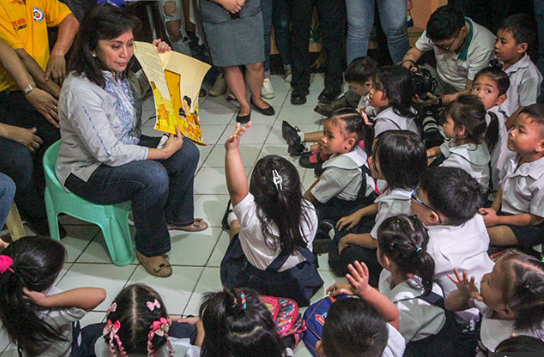 "WALANG KADUDA-DUDA, HIGIT NA MAS PILIPINO SI PACQUIAO KAYSA KAY LENI. ", Prof. Tranquilino wrote. The professor, who is patent for being fearless in speaking his mind over various national and political issues, then ceased that if it was Robredo whom the Oxford invited to speak, he is certain that the content of her speech would only be that of denouncing President Duterte, hence, talked about a book titled 'Digong Dilaw'. "Kung si Leni ang naanyayahang magsalita sa Oxford, sigurado ako kung hindi pambabatikos kay Pangulong Duterte ang laman ng kanyang talumpati, Digong Dilaw ang isasalaysay nya sa mga taga-Oxford Union. ', he bravely uttered. "WALANG KADUDA-DUDA, HIGIT NA MAS PILIPINO SI PACQUIAO KAYSA KAY LENI." "Kung si Leni ang naanyayahang magsalita sa Oxford, sigurado ako kung hindi pambabatikos kay Pangulong Duterte ang laman ng kanyang talumpati, Digong Dilaw ang isasalaysay nya sa mga taga-Oxford Union. On days when we had no food I would drink lots of water just to fill my stomach. But my mind and spirit were never hungry. I read anything I could get my hands on,” he said. Dreams do come true. Being poor does not mean one must die poor. Hard work and persistence will set you free from the shackles of poverty. But it is faith that will take you to the very top,” Pacman concluded."